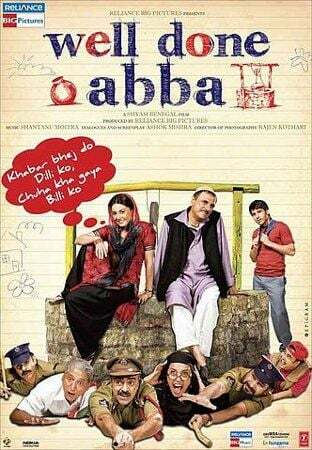 Well Done Abba is a delightful farcical comedy about corruption in India. Armaan Ali (Boman Irani) is a chauffeur in Mumbai who returns to his village near Hyderabad to get his daughter married. He planned to go back for a month, but ends up staying for three months. When he get to his village, he learns there is a water shortage. So he has the idea of building a well. (Hence the name of the movie, Well Done Abba, which I just put together now). To which the government official asks, do you want to be temporarily in poverty or permanently? Most people want permanent poverty, he explains, because they are eligible for free schooling, cheaper housing and many more government services. All Armaan had to do was give the man his Swiss watch and a percentage of his loan for the well and he can have permanent poverty. There is much humor and irony as Arman goes through all of the steps to have the well built. When he reaches the end of the process, it is no surprise when no well is built. But what he does have is a picture of the non-existent well, a letter from the local Sarpanch (an elected town leader) that says she tasted the water from the well, and a letter from the well’s engineer stating its completion. I don’t want to give away too much, so I’ll stop there. But I will say, as you would expect, the movie does have a happy ending. As an American, when I watch a movie about this kind of corruption, it does not apply directly to my life. In India, corruption is something that every citizen deals with directly. To vote you need a voting card, to get a passport, to file taxes, to get a birth certificate, a marriage license or if you want a decent job you encounter people who demand a, let’s call it “gratuity”. And what you get in return is not always clear. So as an America, I view a movie like this as two things. One, it is a warning of the dangers of letting corruption seep into our system. As voting citizens, we allow for certain amounts of corruption, or certain forms of it that we brush off and feel helpless to do anything about. Well Done Abba is a warning about what could easily become of our government. One of my first questions when I watch an Indian movie is, is it a window into the culture? I would say Well Done Abba is. I learned a bit about how local governments operate and how people interact with it in their daily lives. Well Done Abba was also humorous and entertaining. They did stick in a couple of unnecessary songs, but that is box that has to be checked off in most Indian movies. And the pace was a little slow at times, I would have cut twenty minutes or so off to pick keep it moving. But overall I recommend it for its humor and the window into the culture it provides. Comments on "Movie Review: Well Done Abba!"